Otters, originally uploaded by jahansell. At first I thought these were beavers, which I've often seen in ponds around Sharon, though never this one. But they were too small and swift and when they dove there was no flip of a giant tail. So I conclude that they are otters MUSKRATS! Thanks, Anonymous!, which I"ve heard are around but have never seen. This pair was chasing each other around Mudge Pond (aka Silver Lake, aka Crystal Lake, right, Rick?) on Sunday morning. Having been corrected, I did some quick research on Muskrats (with that old song - is it by Captain and Tenille? going through my head...muskrat, muskrat, candlelight, doing the town and doing it right...) ... and found, among other things, muskrat recipes. Let me know if you are interested. A good new! I think it means the water is clean enough to allow many fishes. where do you find all these beautiful photographs? They are splendid. Muskrats! Of course! I better look up both to make sure! 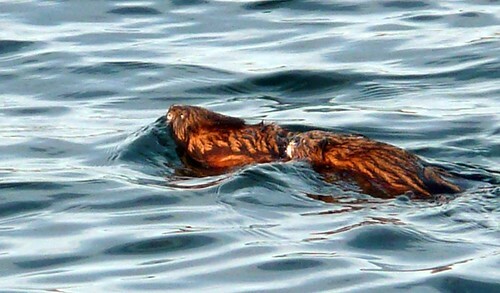 I always wondered what a muskrat looked like! I thought they'd be much more rat-like.